I’ve seen a lot of white things in my life. But the “I was told by AppleCare”-like outrage at comedian Michelle Wolf’s brutal takedown of the professional liars known as Kellyanne Conway, Sarah Huckabee Sanders and Donald Trump following Saturday’s White House Correspondents’ Dinner might be one of the top 10 moments of white tears I’ve ever seen. The American media has joined President Donald Trump in declaring that it is OK to call Mexicans “rapists”; to refer to African Americans as unemployed thugs; to paint Muslims as terrorists; and to mock disabled journalists and praise white supremacists for their diligence in protecting monuments—but insulting white women is totally uncalled for. 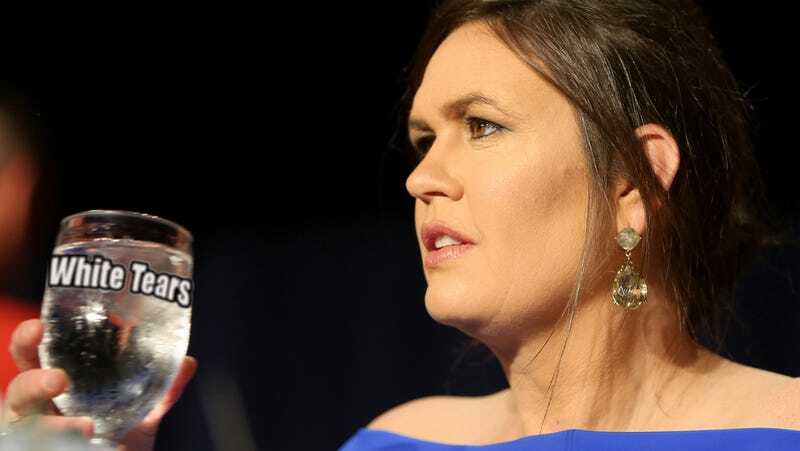 If the media and the press are outraged by the bullying of Sanders and Conway, why did they sit silently in the room when Trump administration officials bullied White House correspondent April Ryan? Why haven’t they taken Sanders to task for lying about the president’s “shithole countries” remarks? Apparently these incidents were not as egregious as the attacks on the unassailable character of “Alternative Facts” Conway and Succubus Sanders. Not because they are white women, but because they bully the American people every day with a barrage of lies, insults and blatant racism. Yet when the tables are turned, they want to call foul. Going to a dinner that traditionally roasts the president and his administration and being outraged when you are the subject of the roast is the ultimate definition of privilege. They are the ultimate snowflakes. It’s one of the whitest things I’ve ever seen.